In 2014, the Royal Canadian Mint will be kicking off a new biannual series as a follow-up to their very popular wildlife series: the Birds of Prey. The first issue, released in February, focuses on the peregrine falcon. There will be a total of four different Canadian bird of prey designs released in two years. With the .9999-fine Silver purity, face value CAD 5, articulate bird design and low mintage, the Canadian Birds of Prey 1 oz Silver Coins are sure to be a hit with bullion enthusiasts and coin collectors alike. 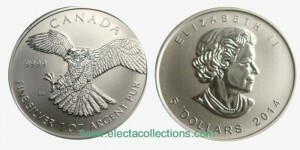 This entry was posted in World Coins, World Coins Silver and tagged 1 oz, 2014, Birds of Prey, BU, Canada, Silver by Electa. Bookmark the permalink.